Liquidity Nanotech is trying to change the world. But for once, the cliché could actually be applicable. The company is launching today onstage at Disrupt NY 2015 with the Naked Filter, a consumer water bottle with its proprietary water-filtration membrane built-in. Liquidity doesn’t look like an average startup. Built on over 15 years of patented university research, the team is a who’s who from the biggest and most respected names in the water business. The company’s CTO was formerly the head of 3M’s Worldwide Water Group. The director of technology came from Brita, where she was the technical lead. One of their founders invented reverse osmosis, the process that makes desalination possible. At a glance, the Naked Filter looks like any other camping water bottle. The key is what’s going on under the surface. Liquidity’s core technology was developed and patented out of Stony Brook University. It’s a membrane with pores of .2 microns in width, small enough to eliminate microbial contaminants that make up the vast majority of water quality incidents. This includes issues that are common in both developed and emerging markets from E. coli and Salmonella to SARS and even the norovirus. Of course, water purification methods and filters are available today but often force users to choose between effectiveness and convenience, which has made adoption extremely difficult. On the effective side, chemicals like iodine and chlorine change the taste of the water and UV requires a long wait time and filters that require pumping or a high level of pressure provided by the user — the latter which is especially challenging for children. Then there is the at-home purification market with the majority of those products doing nothing to improve water quality but simply improving taste. Easy to use, but ineffective. 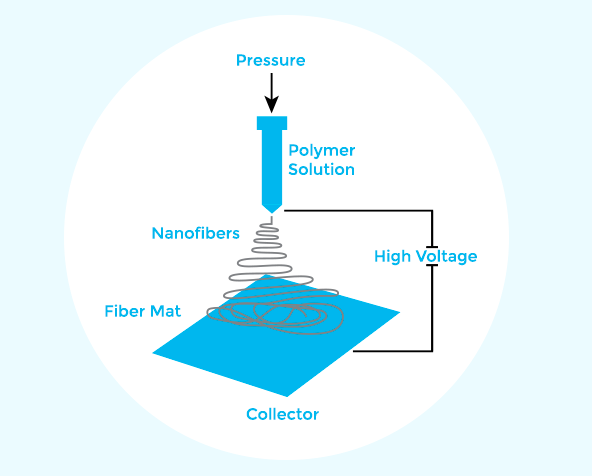 To create the nano-fiber thin membrane that could be produced at scale, Liquidity had to invent their own manufacturing process. Over the past 10 years, Liquidity has done just that, perfecting its patented electro-spinning 3D-printing technology. The process begins with liquid polymer and a collector plate. Voltage is applied to the polymer and plate, which creates a pull to draw the liquid polymer out of its container toward the plate. As the polymer travels, it becomes increasingly thin. So thin, in fact, that at some point, air resistance actually begins to influence the flow of the liquid, causing the now-thin polymer to become convoluted as it falls onto the collector plate. During the trip, the polymer solution also converts to a solid. The resulting pattern is a 3D mat of a seemingly random, extremely thin fiber array. This filtration membrane is highly flexible and durable and can be produced in a variety of sizes. Electro-spinning is not a new process. However, the Liquidity team developed a multi-nozzle system allowing for membranes to be manufactured at scale. Previously, existing materials and production techniques limited the ability of a filter to only capture microbes that were larger than 1 micron. With their newly minted method of fiber formation, Liquidity pore size is down around .2 microns. Liquidity’s tech has been third-party verified by BioVir Laboratories, a microbiological testing facility, that it meets the EPA standard of 99.9999 percent bacterial removal for safe drinking water. Though the tech is strong, the challenge of adoption still remains. By creating a bottle that is extremely easy to use, Liquidity hopes first to tackle the outdoor enthusiasm of Western countries. As of today, you can pre-order the Naked Filter bottle on their website; it ships this summer. The company is also looking to provide in-home and in-office filtration systems. A larger market opportunity is in the emerging middle class of countries like Brazil and India. These regions have poor infrastructure and water quality but increasing purchasing power. Many are already using some type of at-home method of water purification but with little success. Ultimately, though, Liquidity sees its strength as a technology player and aims to become the “Intel Inside” of the water industry. Industrial applications in everything from medical and pharma to oil and gas are huge.